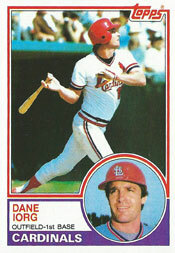 Dane Iorg established the standard for Cardinals designated hitters in World Series play. In 1982, when the Cardinals first used a designated hitter in a World Series, Iorg produced splendidly. A left-handed batter, Iorg, 32, was a reserve outfielder and first baseman for the 1982 Cardinals. He made 62 starts in the outfield and five at first base that season. Used as the DH in five of the World Series games (manager Whitey Herzog went with Gene Tenace in Game 1 and Lonnie Smith in Game 5), Iorg batted .529 (9-for-17) with four runs scored. Five of his hits were for extra bases (four doubles and a triple). Iorg tied the record for most hits by a DH in a World Series, equaling the mark established by Reggie Jackson of the 1978 Yankees and Hal McRae of the 1980 Royals. In Game 6, Iorg had a double and a triple off starter Don Sutton and a double off Doc Medich, setting a World Series record for most extra-base hits in a game by a DH. Described by Sporting News columnist Bill Conlin as the “Cardinals’ sweet-swinging DH hero,” Iorg finished the Series with a slugging percentage of .882, the best of any hitter on either club. Only three players had hit more doubles in one World Series than Iorg did in 1982: Pete Fox (6), 1934 Tigers; Jim Delahanty (5), 1909 Tigers; Chick Hafey (5), 1930 Cardinals. Cardinals designated hitters batted .429 (12-for-28) in the 1982 World Series; their Brewers counterparts hit .125 (3-for-24). Terry Pendleton, Lance Berkman and Allen Craig are others who hit well as Cardinals designated hitters in World Series play. In the 1987 World Series, Pendleton hit .429 (3-for-7) with a RBI in two games at DH. Berkman batted .400 (4-for-10) with three walks and three runs scored in three games at DH in the 2011 World Series. Craig batted .364 (4-for-11) in three games as DH in the 2013 World Series.